With the latest Amazon Web Services price list update one important aspect has been lost in the whole buzz about dropping cloud prices – the profit point between on-demand and reserved instances has moved significantly. Therefore you should reevaluate reserved instances if you are using on-demand now, or check if you are still using the best suiting reservation option. It hasn’t been said directly but the clue was in the Amazon’s post “Reserved Instance prices dropping by as much as 37%, and On-Demand instance prices dropping up to 10%”. The relation between on-demand and reserved instance prices was not kept and it means the switch point between them has moved as well. 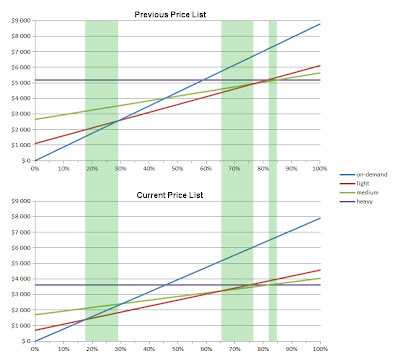 With the new price lists the most affected were standard and high memory instances. The profitability point of the standard reserved instances moved from 31.8% to 19.2% (1683 hours). For high memory instances the change was from 29.2% to 17.5% (1535 hours). High CPU instances had just minor update from 31.8% to 31.3%. Cluster compute and GPU instances did not change the relation, but keep in mind Cluster Compute Eight Extra Large is still the winner with just 13.4% utilization (1178 hours) for the light reserved instance to be profitable. The profitability points for other types of reservations also changed but not that much. The maximum is from 76.9% to 65.2% for high memory medium utilization reserved instance. The heavy utilization changed by 2% at most. The graph shows the change for High Memory XXL. 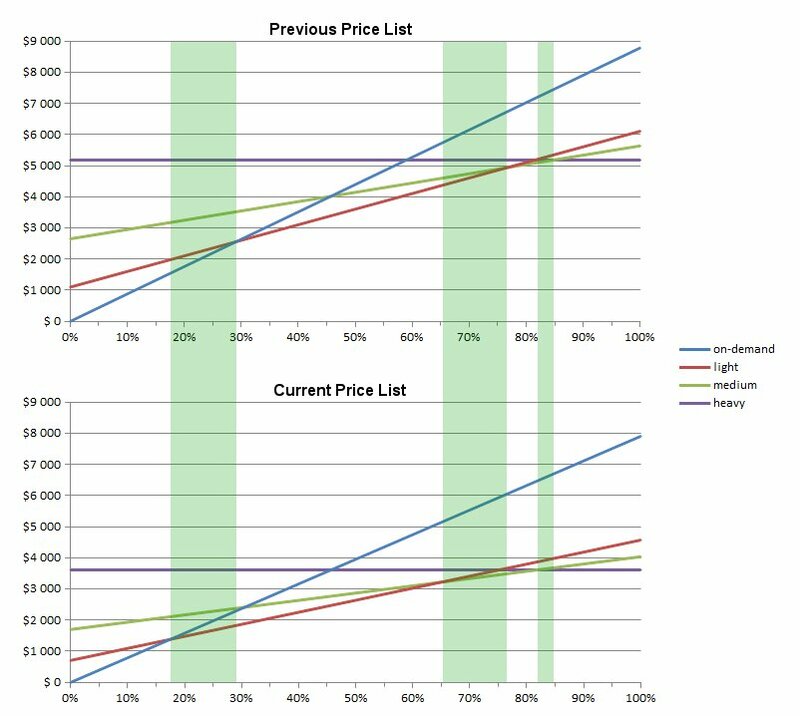 The upper part shows price of various reservation types according to utilization with previous price list, the lower with current price list. The green areas indicate change of best reservation option – either from on-demand to light reserved instances or to higher reservation option. But what does it mean to me? If you were below the threshold so far and you use on-demand instances, you should definitely check if now it isn’t cheaper to take light reserved ones. If your server runs for more than 4 hours 12 minutes a day – check reserved instances. If you know your server will run at least 2 months and 1 week all the time, you are again in the reserved instances zone. Similarly for 9 months of 8 hours per business day, or any other pattern in which you would exceed the required number of computing hours. Similarly you should also check if a higher reservation wouldn’t provide a better deal. If you use the cloud computing comparison engine, it will tell if and which reservation is most appropriate in a given case. To get maximum of the cloud economics you should always check if you use the best option. Currently many users will find profitable to either switch from on-demand to light reserved instances or going to higher reservation level. Check if you are one of them. I am glad to talk with my IT support adviser in Bristol about this one before they have rolled out the new prices. If you haven't go over yours, now is the time to do it.